It’s quiet outside the old Rangiwahia dairy factory. On the way up it was blowing a gale, but now the only sound is the tractor in the paddock up the hill. 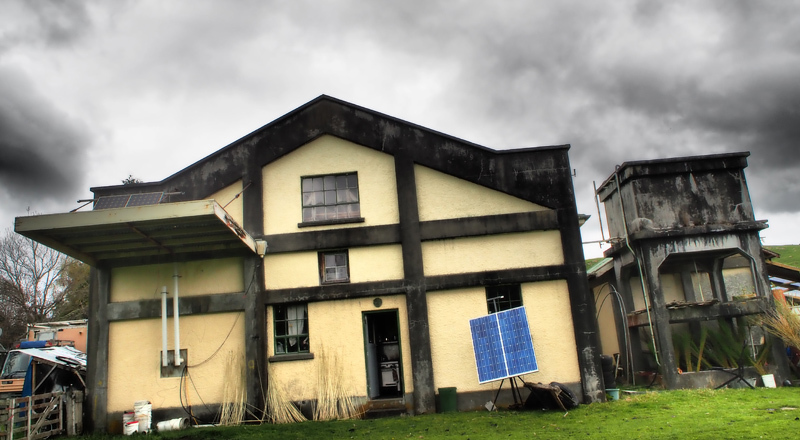 The place was built in 1936 and lived for just five years, a casualty of the dairy industry’s ebb and flow. For a while its future was uncertain. It could have shared the fate of its companion dairy down the road, whose concrete bones gather moss amid the roaming sheep. 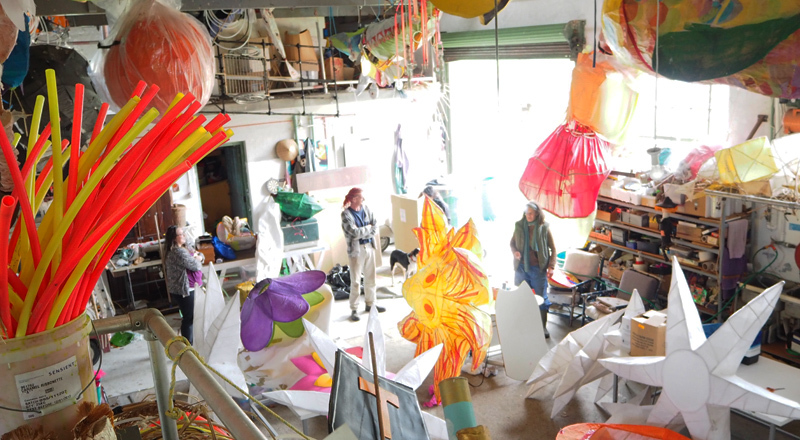 But then, eight years ago, Jim Richards and Bridget Murphy arrived, and the factory became the home of the Rangiwahia Environmental Arts Community Trust (REACT), and their giant puppet and lantern work has been dropping jaws across the North Island ever since. International Women’s Day is approaching, and three of us have come up to collect Esmeralda, one of the Big Girls – outsize puppets that REACT made for Te Manawa in 2013. Bridget’s telling us about the whopping nine-metre puppet they made for a recent festival in Wellington, as Jim arrives back from getting the sheep in for shearing. Marvin “the Magnificent” charges in to greet us too. He’s a good dog and knows it! REACT and Te Manawa have worked together a lot. Remember the Matariki stars in the foyer last year? 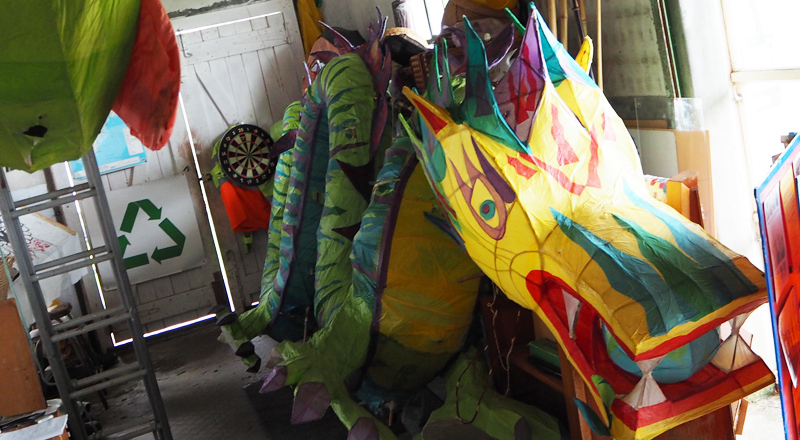 You might have seen Esmeralda and her sisters out and about, but you’re most likely to be familiar with REACT’s work from the Festival of Cultures’ lantern parade: the rabbit, the tiger, the dragon, all lit from within. Jim and Bridget don’t really plan each piece, preferring to launch into it and get a sense of how it works while it’s going together. Even for the dragon? That thing is super complex. “We drew an outline for that one,” Jim allows. They’re built literally from the ground up. The willow branches used for all the frames are grown from shoots on land behind the factory, then harvested, stripped and dried. Everywhere stand barrels filled with willow at each stage of the process; sheaves of switches lean against the factory wall. The factory interior is crammed to bursting with materials and projects. Some are old, some half-finished, some are just awaiting the call to action once more. Is there any danger of running out of room? REACT spends as much time building bridges in the community as it does working on puppets and sculptures. We say our farewells and begin the long drive back to Te Manawa, Esmeralda tucked safely into the back of the van. With REACT on site this week working with our migrant communities, she will soon have some new sisters. We can’t wait to meet them. The Big Girls will parade from Te Manawa to The Square for a picnic on International Women’s Day, Tuesday 8 March, departing the museum at 12pm. Rob Mildon has worked in the field of puppetry. He hopes to one day be a real boy.